Sure, the majority of birds head south for the winter, but that doesn’t mean it’s time to stop buying birdseed. According to the Audubon Society, more than a hundred bird species supplement their natural diets with food offered at feeders, and in winter, when food is scarce, human assistance is especially important. Feeders also provide pit stops for birds on the way to warmer climates, or returning home when spring finally arrives. Providing for your feathered friends means offering fresh water, shelter, and the right mix of quality seed. 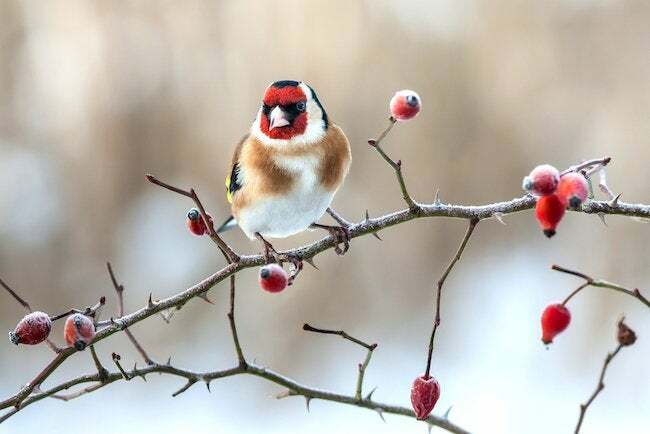 To battle the cold, birds need a high calorie, high fat birdseed mix. If you incorporate only one bird feeder into your yard, go with a sunflower-seed tube feeder that has metal ports around the seed dispensers—these will attract small birds like chicadees, titmice, nuthatches, and goldfinches. Hang feeders at least five feet off the ground, and for your own enjoyment, near a window. Another great winter food is suet, which you can hang from a tree in an onion bag, or a cage-like feeder (make your own out of half-inch hardware-cloth). Chicadees, woodpeckers, wrens, and warblers love to feast on suet. Just make sure any food source is out of the wind, which will keep away visitors. For ground feeding species, like doves, juncos, sparrows, and towhees, a feeder with a screen-bottomed tray that sits a few inches off the ground is a great option, but don’t be surprised if you wind up with some happy squirrels as well. Even more than food, birds need a reliable source of unfrozen water. Try a heated birdbath, or just put out a plastic dish every morning in a protected area of your yard. Finally, build your landscape with birds in mind. Viburnum not only makes for a great shrub border, but birds love the bright red berries it produces. Birds love the protection that any evergreen foliage gives: Ilex (Hollies) is a great option and its red berries come around Christmas time, appropriately festive. For orange berries that double as a nutrient source, go with Firethorn (Pyracantha coccinea), which keeps its fruit even after the foliage drops. Finally, Mountain Ash trees have great clusters for berries perfect for a bird snack. It just takes a little effort to make your yard bird friendly, and the enjoyment their presence brings through the drab winter is more than worth it. If you’re looking for a bird feeder, we have a showcase of some of the best in our For the Birds slideshow. For more on how to prepare your yard—birds or no—check out the Fall Maintenance Checklist.